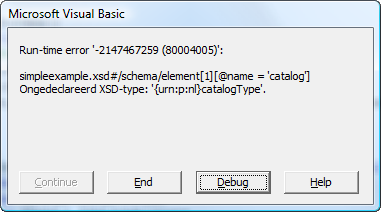 In this post I describe a tool to create an Xml file from a schema (Xsd) using VBA and the DOM and SOM objects of the Microsoft XML library MSXML version 6. The schema has one element (4) as child of root xs:schema. This is a requirement for this tool. The figure below shows the main flow of the process, which basically reflects the structure of a schema. Note that in this figure the return arrows are omitted. Also note that this is a recursive process. After control has returned to CreateXml, the Xml document is validated against the schema and any errors are written to the immediate window. Finally, an Xslt-transformation reformats/indents the Xml document, which is then saved to the outputfile. In the process the Schema Object Model (SOM) is used to interpret the schema, and the Document Object Model (DOM) is used to create the Xml outputfile. If CreateValidStructure is true then CreateXml will only generate the first choice element of a Modelgroup of type SOMITEM_CHOICE. Furthermore, CreateXml will create at least one item of every repeating element, and as many as specified by the minOccurence restriction. This setting creates a valid document structure (but not necessarily a valid document). To resolve this error you must remove the default- and targetnamespace from your schema. Error parsing '' as datatype date. Element 'datePublished' with value '' cannot be parsed. which is obvious: null is not a valid date. Content of element 'book' is incomplete according to DTD/Schema. Here CreateValidStructure was set to false, in which case only one node was created where two were expected since the minOccurence restriction of addressline is set to ‘2’. For more information on the DOM and SOM objects of MSXML see Microsoft XML Core Services. 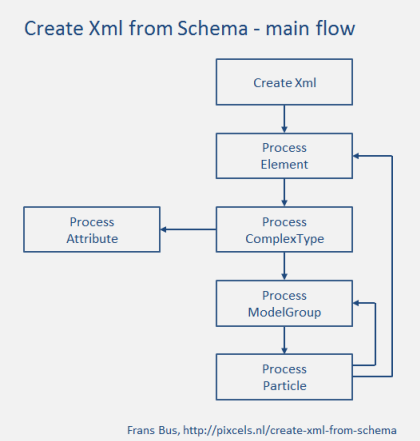 In this article I presented a tool to create a sample Xml file from a schema. However, this tool is also an example of how to use the Schema Object Model (SOM) to interpret a schema, and how to use the Document Object Model (DOM) to create an Xml-file from scratch. In this respect I hope this tool contributes to a better understanding of the XML Schema in general and the Schema Object Model in particular. Another example of schema processing is the Walk the Som application which you can find on the above referenced MSDN page. The two applications have different goals in mind and take a quite different approach to processing a schema. The zip file also includes a sample schema.